It is tough to work under the scorching sun and biting temperature at Guba town which had not been even known to many before the Grand Ethiopian Renaissance Dam was commenced back in 2011. Late Eng. Semegnew Bekele, one of Ethiopia's practical men who tirelessly worked to realize the flag-ship project not only overcomes the harsh temperature but he also ushered it in the path of success. 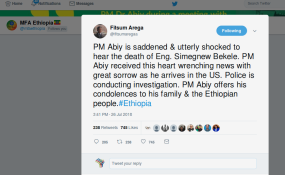 Given the great expectations and hefty impacts the dam could bring to Ethiopia, it might have been a very hard job to take over, but filled with strong patriotism, he handled with astounding performance until his sudden death on Thursday July 26. His ample experience drawn from previous projects at Gibe I and Gibe II, made him the best candidate for the job and that was what he had proven so, as his close compatriots described him. In fact, millions of people of Ethiopia both at home and abroad have been throwing their full weight behind his achievements. And his dedication was a building bricks to the Dam's construction which the people vigilantly awaits its completion. More than generating power, the Dam is also a showcase of the country's growing success in accomplishing mega projects with local capacities. And his role to this very fact was irreplaceable. "Semegnew has reached the zenith of his career. He was among the efficient and front runners in Ethiopia's energy development activities," underscored Eastern Nile Technical Regional Office Executive Director Fekeahmed Negash. The 4.2 billion USD flag-ship project has now reached at a decisive stage hitting over 65 percent completion--tribute to his dedication. "His death is untimely and heartbreaking for every Ethiopians. While our sorrow is intense, it will be up to us to complete the construction of the dam and remember the contribution Eng. Semegnew to his country." Despite the construction of the Dam with own finance, its purpose transcends to the energy integration of the Basin states in particular and the Horn as a whole. Previously, the Basin states were known for their competition over the natural resource. But the commencement of the Dam's construction has brought the nations together. Downstream countries have understood the Dam's significance and started to cooperate in many fronts. The trio-talks among Ethiopia, Sudan and Egypt are notable in this regard. Semegnew's brilliant explanation about the Dam's positive impacts to downstream countries is like no other. He was repeatedly saying that downstream countries' could benefit from regulated flow of the waters of the Nile, and could protect their dam's from sedimentation. The project managers' task was, therefore, of two folds. Overseeing the Dam's construction and creating clear understanding about the possible impacts of the dam. It could not be exaggeration is one says that he was also a diplomat in this regard. As manager Semegnew was coordinating and leading the project staffers setting himself as a good model. And united in grief, the people will rather display sustained support as they have been doing. "He was very confident and hardworking man that he was able to mobilize the entire staffers of the project, said Office of National Council for the Coordination of Public Participation on the Construction of the Grand Renaissance Dam Communication Director Hailu Abrha. Though his departure causes a great sorrow and regret, his legacy and immense contribution is only paid off through completing what the he and the country started. It is to be recalled that The Ethiopian Herald reported that the participation of the people continued with great fervor. Hailu said close to 1.7 billion Birr was collected during the last Ethiopian fiscal year. The plan was to collect 1.4 billion Birr, he noted. Members of the Ethiopian Diaspora have also contributed over 73 million Birr. The public participation is not only expressed in terms of financial contribution, he said, adding that the environmental protection tasks outweigh the financial one.